The Sand People in Star Wars are the nomadic scavenger desert thieves on the planet Tatooine. They were later renamed ‘Tusken Raiders’ since they found ‘Sand People’ to be politically incorrect (I think the Jawas were originally known as desert scavenger midgets). 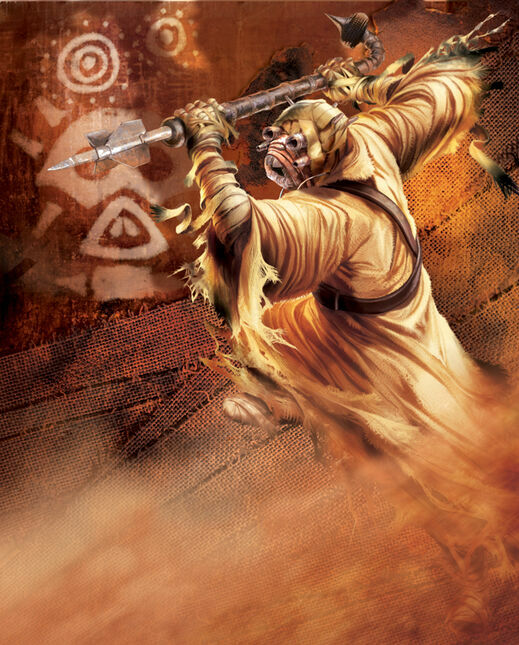 Read more about Tusken Raiders on Wookieepedia. Mix your own Sand People sounds at Star Wars Soundboards. There are several Sand People action figures available on Amazon.com. I had it, but I wasn’t a fan because his plastic robe easily tore off and his gaderffii easily snapped on the end. Later versions of him had a cloth robe. Hot, huh? Nomad gypsy women rock. Even better, there are action figures for the Tusken Raider Female with Tusken Child. This shirt is hard to find now but it may come up on eBay. I’m surprised that there isn’t a Marc Ecko Tusken hoodie, like he did with Boba Fett. This statue, which had a starting price of $300, has received great reviews from collectors. This isn’t a huge statue and yes, it is from the prequels, but it does depict Anakin Skywalker slaughtering these desert-dwelling nerf-herders. He did it! He’s doing the pose! Here is a statue of a Tusken Raider on his elephant in drag. It’s the Bantha, a woolly mammoth looking mofo. Read more about the Bantha on Wookieepedia. More Slave Leias should dance like this. Professionally in clubs.